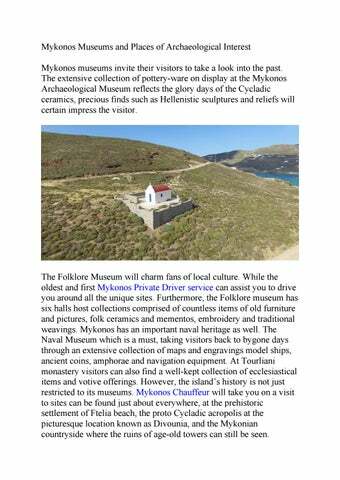 Mykonos Museums and Places of Archaeological Interest Mykonos museums invite their visitors to take a look into the past. The extensive collection of pottery-ware on display at the Mykonos Archaeological Museum reflects the glory days of the Cycladic ceramics, precious finds such as Hellenistic sculptures and reliefs will certain impress the visitor. The Folklore Museum will charm fans of local culture. 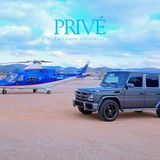 While the oldest and first Mykonos Private Driver service can assist you to drive you around all the unique sites. Furthermore, the Folklore museum has six halls host collections comprised of countless items of old furniture and pictures, folk ceramics and mementos, embroidery and traditional weavings. Mykonos has an important naval heritage as well. The Naval Museum which is a must, taking visitors back to bygone days through an extensive collection of maps and engravings model ships, ancient coins, amphorae and navigation equipment. At Tourliani monastery visitors can also find a well-kept collection of ecclesiastical items and votive offerings. However, the islandâ&#x20AC;&#x2122;s history is not just restricted to its museums. Mykonos Chauffeur will take you on a visit to sites can be found just about everywhere, at the prehistoric settlement of Ftelia beach, the proto Cycladic acropolis at the picturesque location known as Divounia, and the Mykonian countryside where the ruins of age-old towers can still be seen. Just a short distance outside the island’s capital which is called ‘’Hora’’ in Greek lies a domed tomb ins of age-old towers can still be seen. Just a short distance outside the island’s capital which is called ‘’Hora’’ in Greek lies a domed tomb dating from the Mycenaean period which was discovered just a few years ago, indicating that all the time periods can exist harmoniously on the island.